The gallery displays some of my best original paintings. Many may be purchased directly by contacting me. We ship worldwide via the local UPS store. Or come by our house to pick it up at the studio. Oils are shipped flat on canvas stretchers unframed. Watercolors and Inks are matted and shipped flat. Dianne Campbell pursued her interest in art, taking classes and painting while teaching Language Arts in Charlotte, Salisbury, and Winston-Salem. She also taught elementary art in private school. 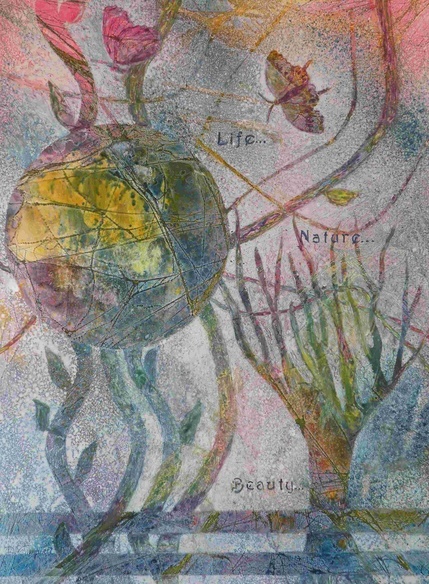 When she retired from public school teaching in 2002, Dianne became a full time artist, studying under several local artists as well as attending workshops, which included Wildacres and Cheap Joes in Boone to learn such things as printmaking, abstract design, plein air, and other innovative techniques. 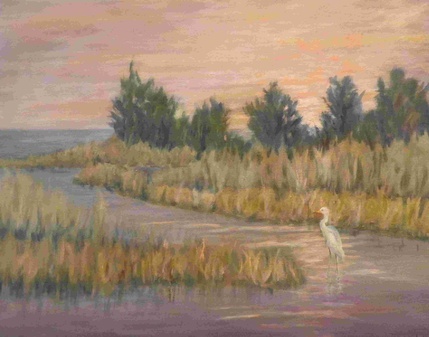 A member of Associated Artists of Winston-Salem, she is an active member of the Associated Artists Community Exhibit Program, and has had her paintings in many locations in the Winston-Salem area. She also exhibits and sells her works in other galleries in North Carolina. She was in a successful two woman show and also a three woman show at Allegacy's Keener Gallery in Winston-Salem. 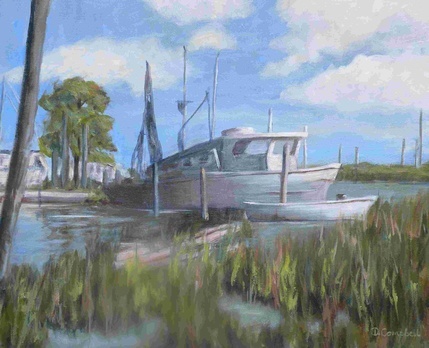 She has entered many juried shows and won awards, including First Place and "Best in Show". 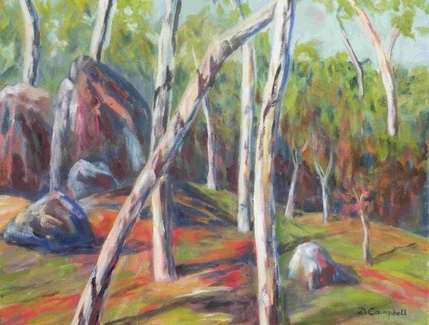 The world of nature is generally her favorite subject matter, particularly landscapes, woods scenes, and still life, and she loves to experiment with her "Impressions of Nature". Living on the Yadkin River in rural Forsyth County and traveling with her husband afford many opportunities for inspiration. 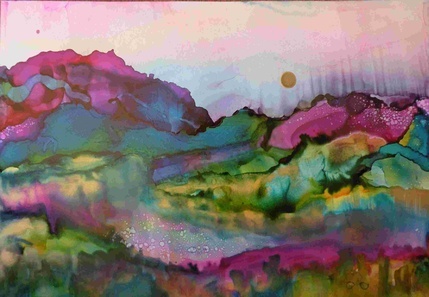 She works in oils, watercolors, acrylic, pastels, and more recently, alcohol inks. The world of nature is my inspiration. It doesn't have to be literal. I like to give the impression of an organic substance and let the viewer see what comes to them. Sometimes there is a message. Other times I just want the feeling of the natural essence of whatever I am depicting. If my work can be enjoyed, that is great. If it can be admired, even better. But if it is inspiring to the viewer or felt on a deep level, I can't take the credit. I simply feel I have listened to my heart and I feel very grateful that I have allowed the beauty of nature to come through me. 16" x 20" Oil on canvas $275. 18" x 24" Oil on canvas $300. 18"x 24" Oil on Canvas $275. 20"x24" Oil on Canvas $325. 24" x 36" Oil on Canvas $325. This represents my alcohol ink series. All are different and original. Two sizes are available - 5"x 7" for $50, and 8"x 10" for $80. All are matted. 18" x 24" Oil on Canvas $275. 24" x 30" Oil on Canvas $370. 18"x 24" Oil on Canvas $325. 16" x 20" Oil on Canvas $250. 25"x 17" Watercolor, matted $275. 11" x 14" Oil on Canvas $150. The world of nature is my inspiration.